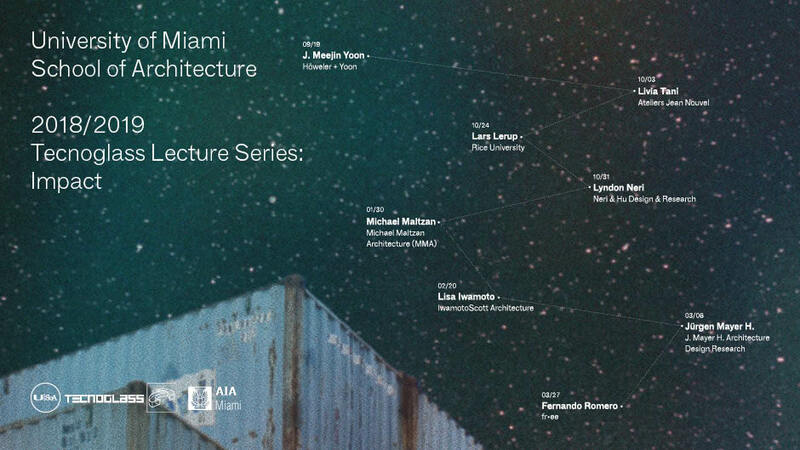 The University of Miami School of Architecture announces its line-up for the Fall 2018 | Spring 2019 Tecnoglass Lecture Series, now on its 5th year at the U-SoA, Coral Gables campus. The Tecnoglass Lecture Series is a year-long program of lectures, interviews, and symposia focused on a theme that is of particular relevance to the U-SoA community. The 2018-19 series is titled “IMPACT,” pointing to practices and works that have a significant effect on the built environment, whether with large infrastructural intervention or small but potentially transformative contributions. The line-up for the Fall 2018 semester will feature: J. Meejin Yoon (September 19th), Livia Tani (October 3rd), Lars Lerup (October 24th), and Lyndon Neri (October 31st); the Spring 2019 semester will include: Michael Maltzan (January 30th), Lisa Iwamoto (February 20th), Juergen Mayer H. (March 6th) and Fernando Romero (Marc 27th). Additionally, starting with the first lecture, Tecnoglass and U-SoA are proud of the newly-established partnership with AIA Miami and AIA Continuing Education, AIA Miami. AIA will be offering 1.5 continuing education credits for each of the (8) Tecnoglass Lectures. (Sign-up and registration for these credits will be coordinated at the door). The lectures take place on Wednesday evenings at 6:30 p.m. in Glasgow Hall, Jorge Perez Architecture Center.